Most of the information from today’s post comes from the 1990 book Daddy Come Home: The True Story of John Lennon and His Father by Pauline Lennon, the second wife of Freddy Lennon, John’s father. The book was written primarily using Freddy Lennon’s unpublished autobiography, which was written during his estrangement from John; Freddy wanted John to be given the manuscript after his death so that John would know the true story of his life and the break-up of his marriage to John’s mother. Contrary to the popular “urban legend”, Freddy Lennon did not abandon John at age five and then show up during Beatlemania with his hand out. Freddie Lennon was not perfect, but he made countless attempts to keep his marriage together for the sake of John, as well as to be a good father. Not many people know that John Lennon had a half-sister who disappeared off the face of the earth. During the war, Freddy Lennon was a merchant seaman who regularly sent home his paychecks to his wife Julia and their son John. Freddy was away at sea for incredibly long periods of time. In 1944, Julia Lennon, John’s mother, began an affair with a Welsh soldier named Taffy Williams who was stationed in Liverpool. She had already been thinking of divorcing Freddy. Julia became pregnant. Freddy came home to the shock that Julia was pregnant and went to confront the soldier. He began by telling the soldier that he still loved Julia. The soldier said he wanted to marry Julia. Freddy suggested that the two of them talk with Julia. Back at their house, Freddy made the offer that he would stand by his wife and raise the child as his own, but Julia rebuffed him with a sassy comment. Freddy then made mention of the baby and the fact that the Welsh soldier wanted to marry her. Julia immediately told the Welsh soldier to “get lost”. Taffy Williams, the soldier, was in absolute shock, so much so that Freddy and his younger brother Charlie felt so bad for him that they took him out for a drink to console him. The soldier told them that his parents were wealthy and that he was sure that they would adopt the baby. Freddy seemed to think that this was a good idea. However, Julia decided to give the baby up for adoption. Not only did she view a baby as interfering with her carefree lifestyle, but also her own family was pressuring her to give up the child as well. On June 19, 1945 Julia gave birth to Victoria Williams, who was soon adopted by a Norwegian sea captain. The records were destroyed in Liverpool. John never knew he had this half-sister until he was an adult. He had his lawyers place ads in Norwegian newspapers and hired a private detective, but nothing happened. Of course, many cranks came out of the word work to claim that they were John’s half-sister. However, in 1996 a Norwegian woman named Ingrid decided to research her adoption records and got a big surprise! Ingrid did not come forward until several years later because she wanted to wait until after her adoptive mother had died because she felt it would have hurt her mother too much. Ingrid had all the documented evidence and only came forward to put the whole thing to rest. She said that she was flattered that she was related to John Lennon, but said that her adopted family was her real family. She had worked her career as a manager of a company that cleaned high-end houses and was very satisfied with her life. Ingrid returned to her anonymity and has never tried to cash in on her connection to John Lennon. This book is about Alfred "Freddie" Lennon and his relationship with his son, John Lennon. Published in 1990, it is partly an autobiography of Freddie Lennon and partly a narrative of Pauline Lennon's observations of Freddie and John Lennon. Pauline Lennon married 55-year-old Freddie Lennon when she was 20. The two met during the Christmas holiday in 1966 while both worked in the kitchen of the Toby Jug Hotel in Surrey, England. Pauline discusses her romance and marriage to Freddie in the book. I had previously read that Freddie Lennon married a "Beatle Fan," but Pauline denies this and goes to great lengths to show that she sincerely loved Freddie. In fact, the couple had two children together and seemed to be happily married until Freddie's death in 1976. The first couple of chapters are based on Freddie's unpublished autobiography and gives detail to the Lennon family history. It also gives some new information on the relationship of Freddie and Julia Stanley, John's mother. Julia was a slim, attractive, unconventional lady. She met Freddie in Sefton Park when she was fourteen. They were friends for years and then later became lovers. During this time, Freddie began working on cruise ships as a bell boy, steward and waiter and would be away from Liverpool for weeks or even months at a time. They were married against the wishes of Julia's father on December 3 1938 and spent their honeymoon at the local cinema. The day after the wedding Julia went back to her parents' home and Freddie sailed for the West Indies working as a steward. Having no place of their own, the couple lived with Julia's parents at 9 Newcastle Road, Liverpool (Near Penny Lane). It was here that John Lennon spent his first few years of life with his parents. However, from 1940 to 1944 Freddie was home for a total of only three months. Julia became inpatient with Freddie's absence and sought companionship with others. Julia became pregnant by a soldier and gave birth to a girl in 1945. The baby was given up for adoption. Julia then met John "Bobby" Dykins in 1946 and would stay with him until her death in 1958. With the marriage effectively over, Freddie asked 5-year-old John to choose between he and his mother. 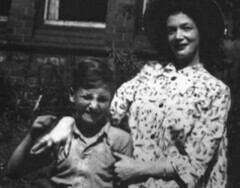 John chose his mother, only to be given to Aunt Mimi Smith who raised him with husband George on Menlove Avenue in Liverpool. This freed Julia so that she could move in with Dykins. Freddie went back to sea and never saw Julia again. Young John ended up losing both parents. There is an absorbing dynamic in the relationship between John and his father. From their first face-to-face meeting in 1964 to their bitter split in 1970, Pauline has written an interesting account of events from her perspective. She portrays Freddie in the best light possible and is critical of John's actions throughout the book. The first meeting between John and Freddie in 1964 lasted only 20 minutes. Freddie then continued to work as a waiter and later even released his own record to cash in on the Lennon name, but was unsuccessful. At the urging of Charles Lennon, John's uncle, he met his father again in 1967. In 1967, John had obviously made an attempt to forgive his father for being absent during his childhood. He invited Freddie to live with he, Cynthia and Julian in his Kenwood mansion in London. John even gave Pauline a job as an au pair and let her live at Kenwood. John invited Freddie and Pauline to attend the premier of Magical Mystery Tour with he and the other Beatles. He also began paying Freddie an allowance equivalent to his earnings as a waiter. Finally, he bought and gave Freddie a house in Brighton following his marriage to Pauline and the birth of their first child. However, Pauline paints all of this in a dark light because she feels John owed much more to his father. Most likely the events of 1970 forever changed her opinion of John and she can no longer see the good things that John had done for Freddie. In 1970, John underwent his much publicized Primal Scream therapy with Yoko Ono at Arthur Janov's Primal Institute in Los Angeles. Here he relived the pain of losing his parents as a child. John's repressed anger toward his mother and father was revealed. Janov told John that to exorcize the root causes of his neuroses, John must confront those who inflicted the pain on him. Upon his return to England, John summoned Freddie for a visit on his 30th birthday. Freddie expected a party and brought along Pauline and their child, as well as a birthday gift. John shocked Freddie by abruptly announcing that he was cutting him off completely. He stopped giving Freddie money and kicked he and Pauline out of the house in Brighton. Pauline goes into great detail and it is obvious that this single event created both pain and fear in Freddie Lennon that lasted for years. From 1970 to 1975, Freddie and Pauline did the best they could on their own and had a second child. Freddie stayed home to care for the children and Pauline worked. It seemed that Freddie was able to erase some of the guilt for neglecting John by being a full-time parent for his two young children. Tragedy struck when Freddie was diagnosed with stomach cancer in 1976. Pauline contacted John and gave him the terrible news. John and Freddie spoke on the telephone and reconciled. John told Freddie that he regretted having gone through primal therapy. He and Freddie even made plans to visit again so that Sean Lennon could meet his grandfather. Unfortunately, Freddie's cancer progressed rapidly and he died shortly afterward. John wanted to pay for the funeral, but Pauline was still bitter and refused his money. This is an emotional book full of unexpected details, but lacking in hard facts like dates and places. Pauline Lennon's writing is well done, but she tends to use some British slang that has no meaning in American English. There is very little discussion of the Beatles in this book, so I do not recommend this for general Beatle research. For those who wish to gain greater insight into what makes John Lennon tick, I highly recommend this book. "Daddy Come Home: The True Story of John Lennon and His Father" by Pauline Lennon may be purchased online. Alfred Lennon was the father of English musician John Lennon. He spent many years in an orphanage—with his sister, Edith—after his father died. Alf was known as being very witty and musical throughout his life—he sang and played the banjo—but not as being very dependable. Although always known as Alf by his family, he later released a record as Freddie Lennon, and was quoted in newspapers under that name. Alf and Julia Stanley married in 1938. John Lennon was their only son together, but Alf was often away at sea during World War II, so consequently did not see much of Lennon during his infancy. Alf later found out that Julia was pregnant with another man's child and offered to look after Julia, Lennon and the expected baby, but Julia rejected the idea. Alf had very little contact with Lennon until Beatlemania, when they met again, but later had intermittent contact with each other. Alf died in Brighton, where he had gone to live after marrying the 19-year-old Pauline Jones. James Lennon (b.1829) and Jane McConville (b.1831)—Alf's grandparents—moved with their respective families to Liverpool in the 1840s. James and Jane were both from County Down, Ireland, now known as Northern Ireland, and were married in St. Anthony's Chapel, Scotland Road. Liverpool, on 29 April 1849. James was a warehouseman/Cooper at the time. They had seven children together: Elizabeth (b.1850) James, John "Jack", William George, Richard Francis, Joseph (b.1865) and Edward. Jack Lennon (b. 1855)—a shipping clerk/bookeeper—is the father of Alf Lennon and the grandfather of John Winston Lennon. In 1888, Jack married Margaret Cowley (from Liverpool) and they had two children: Mary Elizabeth Lennon, and Michael Lennon. Margaret died giving birth to Michael (who also died 15 days later) on 19 August 1892. In 1901, Jack and his daughter, Mary, were living at 3 Lockhart Street, Liverpool, with their housekeeper, Mary "Polly" Maguire. Jack and Polly lived as man and wife even though they weren't yet married. They lived in the Toxteth Park area of Liverpool, and the first four children they had together were all born there: George Lennon (1905, in Denton Street) Herbert Lennon (1908) Sydney Lennon (1909) and Alfred Lennon (1912) were born at 27 Copperfield Street. Jack eventually married Mary (Polly) Maguire in 1915, after they had moved to Elmore Street, Everton. One of the witnesses at the wedding was Polly's sister, Catherine Seddon. Daughter Edith Lennon was born that year and then Charles (21 November 1918—26 May 2002). The Lennons moved back to Toxteth Park, and Jack died in 1921, at 57 Copperfield Street. He is buried in a common and unmarked grave (along with five unknown adults and three children) in the Anfield Cemetery, Liverpool. Polly couldn't read or write, but was reported to be very humorous and supposedly had psychic abilities. After Jack had died, Polly did not have enough money to keep the whole Lennon family together, so she placed two of her children, Alf and Edith, in the Bluecoat School Orphanage. It was situated just around the corner from Newcastle Road (where Julia Stanley lived). Polly died on 30 January 1949. It has often been claimed (by the Lennon family) that Alf's grandfather was a professional singer, a ship's cook, and that he emigrated to America, and that Alf's father, Jack Lennon, became a "refined" British minstrel, who toured America with 'Roberton's Kentucky Minstrels' Vaudeville troupe in the late 1800s. It is also claimed that Jack's first wife was an American, who died during childbirth after they had both moved back to Liverpool. This has been proven—by checking birth certificates, the 1861, 1871, and 1901 censuses—to be false. Photo of Freddie Lennon taken on 18 December 1965. Alfred Lennon (always called 'Alf' by his family) was known as being happy-go-lucky, and "couldn't resist having a good time". Alf had rickets as a child and wore leg braces, which led to his growth being stunted at 5'4". In 1927, Alfred auditioned for a children's music hall act, Will Murray's Gang, at the Liverpool Empire Theatre. Having passed the audition he ran away from the orphanage and joined the show. Alf traveled with the troupe for a time before being discovered in Glasgow and returned to the orphanage, where he was severely punished. Alf was known as being always quick with a joke or a witty line, but never held a job for any length of time. When he was 15-years-old he left the Bluecoat orphanage and found a job as an office-boy, but preferred to visit Liverpool's many vaudeville theatres and cinemas, where he knew the usherettes by name. His brother Sydney often lent money to Alf, after Sydney got a job in a tailor's shop. It was at the 'Trocadero' club (a converted cinema on Camden Road, Liverpool) that Alf first saw an auburn-haired girl with a bright smile and high cheekbones; Julia Stanley. Although Alf did not speak to her, he saw Julia again in Sefton Park, where Alf had gone with a friend to pick up girls. Alf, who was dressed in a bowler hat and holding a cigarette holder, saw "this little waif" sitting on a wrought-iron bench. The 14-year-old Julia said that Alf's hat looked "silly", to which the 15-year-old Alf replied that Julia looked "lovely", and sat down next to her. Julia asked Alf to take off his hat, so Alf promptly took it off and threw it straight into the lake. Alf was musical, and specialised in impersonating Louis Armstrong and Al Jolson. He played the banjo, (as did Julia) though neither Alf nor Julia pursued music professionally. (Julia would later teach Lennon how to play the banjo). They spent their days together walking around Liverpool and dreaming of what they would do in the future—like opening a shop, a pub, a cafe, or a club. In March 1930, Alfred took a job as bellboy on board the Cunard passenger liner SS Montrose. He kept in touch with Julia, writing to her and meeting her whenever he docked in Liverpool. Alf was later offered a job on a whaling ship for two years—which could have earned Alf enough money to buy a house—but turned it down when he found out that Julia's father had arranged the job, so as to keep Alf as far away from Julia as possible. On 3 December 1938, eleven years after they had first met, Julia married Alf after proposing to him. They were married in the Bolton Street Registry Office, and Julia wrote 'cinema usherette' on the marriage certificate as her occupation, even though she had never been one. None of Julia's family were there, but Alf's brother Sydney acted as a witness. They spent their honeymoon eating at 'Reece's' restaurant in Clayton Square (which is where Lennon would later celebrate after his marriage to Cynthia Powell) and then went to a cinema. On their wedding night Julia stayed at the Stanley's house and Alf went back to his rooming house. Julia's family did not like Alfred at all: Julia's father said Alf was "certainly not middle class," and Julia's sister Mimi was particularly opposed to him. Julia's father demanded that Alf present something concrete to show that he could financially support Julia, but Alf's only idea was to sign on as a Merchant Navy bellboy on a ship bound for the Mediterranean. He later worked on Ocean liners that traveled between the Greek islands, North Africa and The West Indies. Alf graduated from bellboy to steward during the months he was away, but when he arrived back in Liverpool he moved into the Stanley home in Newcastle Road. He auditioned for local theatre managers as a 'ship's entertainer', but had no success, and went back to sea. Julia found out that she was pregnant in January 1940. Lennon was born on 9 October 1940, in the second-floor ward of the Oxford Street Maternity Hospital in Liverpool, during the course of a German air raid in World War II. Alf first saw Lennon that November when he returned from working as a merchant seaman on Troop-transports during World War II. He sent regular pay cheques to Julia, who lived with Lennon at 9 Newcastle Road (the Stanley family's home). Alf occasionally went back to Liverpool, but did not stay long before he was sent off on another ship. The cheques to Julia stopped when Alf went AWOL in 1943. Neither Julia nor the Merchant Navy knew of Alf's whereabouts. Julia only found out because she stopped receiving her allowance money, and the Navy wrote to her to inform her that they were looking for Alf. Julia had started going out to dance halls in 1942, and met a Welsh soldier named 'Taffy' Williams who was stationed in the barracks at Mossley Hill. Alf blamed himself for this, as he had written letters telling Julia that because there was a war on, she should go out and enjoy herself. Julia took his advice, and often gave the young Lennon a piece of chocolate or sugar pastry the next morning for breakfast that she had been given the night before. She became pregnant by Williams in late 1944, though first claiming that she had been raped by an unknown soldier. When Alf eventually came home on 13 January 1945, he offered to look after Julia, Lennon and the expected baby, but Julia rejected the idea. Alf took Lennon to his brother Sydney's house, in the Liverpool suburb of Maghull, a few months before Julia came to term. The baby girl, Victoria, was subsequently given up for adoption (after intense pressure from Julia's father and family) to a Norwegian Salvation Army Captain. Julia later met Bobby Dykins and lived with him, but after considerable pressure from Mimi—who twice contacted Liverpool's Social Services and complained about Lennon sleeping in the same bed as Julia and Dykins—Julia reluctantly handed the care of Lennon over to Mimi. Whilst Alf was away at sea, Charlie said that people used to visit the Lennon house in Copperfield Street, offering large sums of money (up to £300) if Alf would divorce Julia, but were told to "get lost" by Charlie. In July 1946, Alf visited Mimi's house at 251 Menlove Avenue and took Lennon to Blackpool for a long 'holiday'—but secretly intending to emigrate to New Zealand with him. Julia and Dykins found out and followed them to Blackpool, and after a heated argument Alf made the five-year-old Lennon choose between Julia or him. Lennon chose Alf (twice) and then Julia walked away, but in the end Lennon, crying, followed her. Alf lost contact with the family until Beatlemania, when he and Lennon met again. In 1968, Lennon told Hunter Davies that he soon forgot his father, saying, "It was like he was dead." Alf later told his version of what happened while he was AWOL (Absent Without Leave) in 1943. He claimed that he had sailed from America to North Africa, but was arrested for stealing one bottle of beer from the ship—consequently serving nine days in a military prison. After his release he became involved in various "shady deals", and was supposedly rescued from a criminal gang of Arabs. He eventually served on a troop ship from North Africa to Italy before finally boarding a ship that was making its way to England, in 1944. In 1949, Alfred's career at sea ended when he was sentenced to six months imprisonment. He had been drinking when, late at night, he saw a mannequin in a wedding dress in a shop window. He broke the window, picked up the mannequin, and danced with it in the street until he was arrested. n 1958, when Alf was working with Charlie Lennon in The Barn Restaurant in Solihull, their brother Sydney sent a newspaper clipping from The Liverpool Echo reporting that Julia had died. A saddened Alf left Solihull for London, but kept in touch with Charlie by phone. Alf made no real attempt to contact his son [Lennon] again until the height of Beatlemania (claiming he didn't know who they were). Alf was working as a kitchen porter at the Greyhound Hotel in Hampton, South London, when someone pointed out a photograph of Lennon in a newspaper and asked if Alf was related to Lennon. Alfred and Charlie visited one of the The Beatles' Christmas shows at the Finsbury Park Empire in London. When The Beatles were filming a scene for A Hard Day's Night in the Scala Theatre in Soho in April 1964, Alf walked into Brian Epstein's NEMS office in Argyle Street with a journalist. "I'm John Lennon's father", he explained to the receptionist. When Epstein was informed, he "went into a panic", and immediately sent a car to bring Lennon to NEMS office. Alf was shabbily-dressed, with his unkempt, balding grey hair greased-back. He stuck out his hand, but Lennon did not take it, saying "What do you want?" Alf placated Lennon somewhat by saying, "You can't turn your back on your family, no matter what they've done." Their conversation didn't last long, as Lennon soon ordered Alf and the journalist out of the NEMS office. The Beatles' personal stories were kept out of the newspapers—by agreement with journalists who were offered exclusive stories in return—but one day Lennon opened a copy of The Daily Express and saw a photo of his father. A few weeks later, Cynthia opened the door of Kenwood (Lennon and Cynthia's home in Weybridge) to see a man who "looked like a tramp", but alarmingly, with John's face. Cynthia invited Alf in, and gave him tea and cheese on toast until Lennon came home, which he was expected to do in an hour or so. Whilst waiting, Cynthia offered to cut Alf's "long, stringy locks" of hair, which he allowed her to do. After waiting for a couple of hours, Alf left. Lennon was annoyed when he came home, and told Cynthia (for the first time) about Alf's visit to the NEMS office a few weeks before. Lennon relented slightly and contacted Alf over the next few months, telling Cynthia that Alf was, "Alright, Cyn. He's a bit 'wacky', like me." After Christmas, in 1965, Lennon was embarrassed to hear that Alf had made a record: That's My Life (My Love and My Home), released on 31 December 1965. Lennon asked Epstein to do anything he could to stop its release, or becoming a hit. The record never made it into the charts, and was soon forgotten. Alf Lennon on the cover of That's My Life (My Love and My Home). In My Life is Lennon's song about his youth in Liverpool. Alf replied to this song by releasing the single, That's My Life, b/w The Next Time You Feel Important, in 1965. Three years after meeting Lennon in the NEMS office, Alf (who was then 56-years-old) turned up at Kenwood again, with nineteen-year-old student Pauline Jones, who was Alf's fiancée. Pauline had been an 18-year-old Exeter University student when she met the 54-year-old Alf in 1966. They said that they were in love and wanted to get married, although Pauline's mother was horrified and totally against the idea. Alf asked Lennon if he could give Pauline a job, so Pauline was hired to help looking after Julian Lennon and also the piles of fan mail. Pauline spent a few months living at Kenwood in the attic bedroom, but Cynthia remembered Pauline, "crying all the time and arguing with her mother on the phone". Alf and Pauline grew tired of trying to convince Pauline's mother to allow them to get married, so they eloped and were married in Gretna Green, Scotland. Alf and Pauline moved to a flat in Bourne Court, London Road, Patcham (in a suburb of Brighton) before relocating to Ladies Mile Road, Brighton, in November 1969. Alf had two sons with Pauline: David Henry Lennon and Robin Francis Lennon, half-brothers whom Lennon never met. Late in his life, Alf wrote a manuscript detailing his life story which he bequeathed to John. It was Alf's attempt to fill in the lost years that he had not been in contact with his son, and to explain that it was Julia, and not Alf, that had broken up their marriage. Lennon commented: "You know, all he wanted was for me to hear his side of the story, which I hadn't heard." By 1976, Alfred had contracted terminal stomach cancer. Pauline contacted Lennon via Apple to make sure that he knew that his father was dying. Lennon sent a large bouquet of flowers to the hospital and phoned Alf on his deathbed, apologising for his [John's] past behaviour. When Alf died, Lennon offered to pay for the funeral, but Pauline refused, and paid for the arrangements herself. In 1990, Pauline published a book called Daddy, Come Home, detailing her life with Alf and his meetings with Lennon. Pauline later remarried, and is now known as Pauline Stone.